What Does Integration Mean to Me? What does 'integration' mean to you? 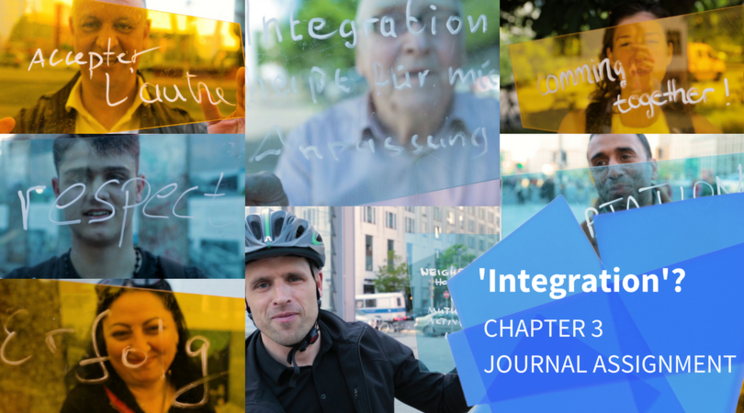 Tell us: What does 'integration' mean to you? In this chapter, we've provided you with a fundamental understanding of the various facets of integration and how the debate and approaches vary in Europe and Canada. While it's important to understand how governments manage (or don't manage) this process, integration is something that doesn't start and stop with policy. That's why we have included views from those working in the field, either supporting or circumventing integration policy, as well as voices from the public to get a taste for how people actually understand this term and what ideal they wish for in their societies. What do you think of Prof. Dr. Naika Foroutan's four fields of integration (structural, social, cultural, identificative), and which do you feel are emphasized most in your society? Would you prefer to see integration as a top-down, bottom-up, or another directional process? What ways do your societies and governments support or not support integration and multiculturalism (e.g. through resources like integration courses or symbolically through representation)? Who in your societies needs integrating, from your point of view? Does integration stop with refugees and immigrants? How do you think we can best measure integration? What counts most (e.g. numbers, personal encounters, building networks)? Where do you think Europe is headed when it comes to integration? Do you think Europe can learn something from the Canadian example? I have lived in five different societies, that is, those of New York, Oregon, Belgium, the Netherlands, and Croatia, in particular in a war-torn part of Croatia. In New York and Oregon, which are two very different societies, integration and acceptance were relatively easy. In the others, there were very strong barriers against integration. I like Dr. Foroutan's model from a theoretical point of view. If we are looking at a top-down model, this all applies. However, the question is, if such a model is proper and is defensible. I believe that there needs to be a horizontal model, that is, where the immigrant and his/her culture adapt to the receiving culture and vice versa, as the speaker from Turkey indicated. That enriches both cultures. In fact, despite protests to the contrary, no government really supports horizontal integration. Their models are strictly top-down. They may give lip service to multiculturalism, but that has nothing to do with reality. I believe that it would be good if the targets of integration were to be politicians, police, and bureaucrats. To me, they are on the margins of society and really need to learn what people on the ground are thinking and doing, and, somehow, to be integrated into society. It is they who present the greatest barriers to an integrated, multicultural society. There should be encouragement of great diversity in society, which makes everyone richer. Measurement of integration is difficult. I think that most Western societies have an obsession with quantitative statistics. I think that qualitative descriptions are far better in this regard. I am pessimistic about where Europe is going with regard to integration. Current governmental attitudes, which emphasize policing and keeping people out rather than welcoming them and treating them in a humanitarian manner, are extremely damaging to all societies concerned. I grant that it is my area, but I am extremely concerned about the lack of psychological assistance to those coming to Europe. I also am extremely concerned that there are no real policies to encourage integration on any of the levels noted by Dr. Foroutan nor to heal the wounds caused in the regions of origin and along the way. I am virtually certain that, in the long run, this will cause disasters in terms of violence and prejudice and racism. I think that one of the questions for this course is how to avoid these problems. The real question is how to get to the policymakers and to those financing such programs and to get them to understand reality.